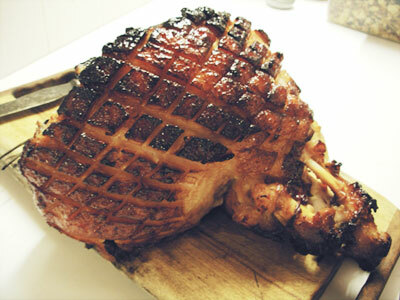 Okay, so if you're going to bake a ham (and it is one of the easiest and most delicious meats to roast) there's a general cooking formula that you follow whatever sort of oven you use, gas, electric or wood fired. I'm going to give you the general formula (as given unto me by my BF Janey, the original Christmas Queen) and then write some specific wood fired oven tips. The ham is going to be terrific no matter what sort of oven you use, but if you have never had your own wood-smoked baked ham, boy are you in for a treat! The extra heat and the smokiness from the fire will take your ham to a whole new level of lusciousness and I know it's not the kind of behaviour you're supposed to encourage in others at Christmas (nor are you supposed to brag about it happening! ), but people are going to fight over your ham. I'm all for lean ham on my everyday sammies and for eating cold, but if you're going to bake a ham, DO NOT CHOOSE A LEAN ONE. Go for the fattiest leg of the most obese piggy you can find, because whilst in life your fat-legged pig may not have been considered a catch, in death he will be DELICIOUS! Don't even bother bringing the ham home for baking if it's packaged so you can't see it or you can see it, but it doesn't have a 2 cm layer of fat directly under the skin and some fat deposits in the middle/around the bone. I MEAN IT PEOPLE. 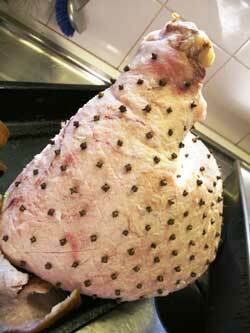 This is no time to be nip-cheesy about things, this is Christmas and the ham must be BOUNTIFUL and RICH. 1. No matter how hard you try, you can't really muck it up. 2. Provided you exercise basic hygiene, there's no way you can poison anyone or make them sick, so even if the ham sits out all afternoon, the leftovers will still be fine for a good week. In the middle of a chaotic multi-day food fest, these two points can be quite reassuring, I find! Starting on one side of the leg, wherever you feel you can get a good handle on things, wiggle your fingers under the pig skin and ease it off. Go slowly. You want to loose the skin and keep all the fat so you have to use your fingers and hands to ease them apart. When you get to the small/boney end of the leg (the knee?!! ), lifting the skin off can sometimes be a bit difficult. You can leave this skin on if you want, just make a cut around the leg (the depth of the skin) and pull the main piece of skin off to there. Using a small, sharp knife or a Stanley knife, cut diagonal lines 2-3cm apart across the newly exposed fatty, presentation side of the ham. These lines need to be the depth of the fat, but not penetrate the meat. Cut similar lines running the opposite way to form a diamond pattern. Stud each "diamond" with a perfect whole clove. If you haven't already, place your ham on a sheet of silicone paper in a baking dish or on a good quality disposable tray - you don't want to have to wash this up today. Just as a matter of interest though, by its very nature, glaze is sticky and it will blacken up wherever it touches the pan and you will look at the pan and think that you will never get it off, BUT THIS IS NOT TRUE! Because of the glaze's high sugar content, all you need to do is fill the pan with hot water and leave it to soak for a day or two and most of the mess will dissolve. Anything left, just cover with a stiff paste of either bi-carb or Mr Muscle and leave it sit for awhile more. 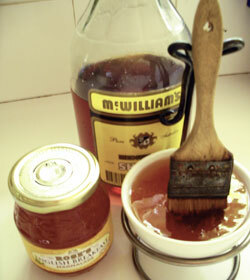 For the glaze, I mix together a 500g jar of good, not overly sweet citrus based jam ( Rose's English Marmalade is ideal), a cup of sugar and a cup of Medium Sweet Sherry and let it sit for at least an hour to reach room temperature and for the sugar to dissolve (though you could also do it a couple of days ahead and fridge it if you want). 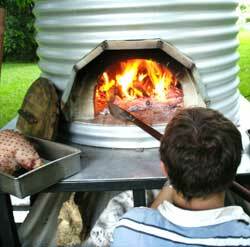 These quantities will provide an amount of glaze sufficient to baste up Razorback (did you see that movie! ), so you can halve the quantity if you like, but I generally find it's quite handy to have a lot of glaze: it will encourage you to slather it repeatedly on the ham, to not worry about letting desperate-to-be-helpful-but-half-sloshed-guests do the glazing for you and also let you be able to give everyone a taste - anything with Sherry in it always tastes good - so that they will be even more juiced-up at the prospect of lunch. Okay, so when you're nearly ready to go, get yourself a basting brush and paint a nice, thick, even first coat of glaze all over your ham. The only other thing that will make your glazing career easier is if you come up with a cover for your glaze pot and brush; flies and bugs and bees just love a sip too! Okay, so as we already discussed, whatever sort of oven you use, there is a standard formula that results in a great ham: Start the ham off at a really hot temperature for around half an hour until the glaze browns up and the fat starts to render, then lower the temperature and continue cooking, taking the meat out and glazing it every half hour or so for an additional hour or two until the ham is lovely and brown and crispy on the outside and the meat in the centre is cooked through. If you are in any doubt as to readiness, insert a metal skewer or a knife as far into the ham as you can, leave it in for 5-10 seconds and then remove and see if the blade is hot. If it is and you're happy with the texture and colour of the outside, you're done. 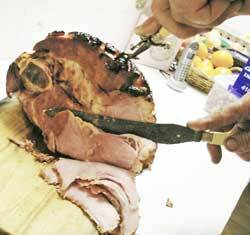 If the blade's not hot, reglaze and give the ham another half an hour, then check it again. If the blade is not hot from being in the centre of the ham and you need to cook for longer but you're worried the outside will burn in the extra time, make an alfoil tent over the pan (try to keep the foil from touching the meat - the glaze will make it stick) and put the pan back in with the presentation side (i.e., the side with the diamonds and cloves on it) facing towards the oven door. This should let the meat cook through without the outside getting any darker. Get your oven nice and hot (as if for pizzas) with a big-ish fire in the centre and an hour or so of casual tending and feeding. Try to time it so the fire is starting to get some nice coals just as the oven ceiling is white and clean (if you use that as an indicator) or whatever else it is you use to tell you its pizza time. If there's still quite a bit of fire-action happening at this point, remove most of the wood and just leave a small fire of mostly coals and maybe one new-ish log for a little smoke. Push this to the back of the oven and over to one side if you can. Put the ham in with the presentation side facing the flames and let it simmer and roast and smoke for a good half an hour. If this is the first time you've done this, just have a look after 10 minutes to be sure the oven isn't way too hot - in that amount of time, the ham fat should be starting to bubble and brown, but not be entirely charcoal or anything! If you think the oven might be a little too hot, pull the pan further away from the flames and leave it 5 minutes and check again. If you think the oven is way too hot, take the pan out completely and wait half an hour. 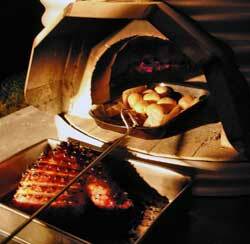 If, at any point, you feel the oven is not hot enough, just take the ham out, bring your coals back to the centre and fire it up again. That's the beauty of baking ham and the reason that it's a great thing to do in the oven if you are a beginner and just learning about the temperature and behaviour of your oven remember point one (the ham is already cooked), so provided you keep a bit of an eye on it so that it doesn't incinerate, everything else is fixable. After around 2 hours and as many bastes as you can bare, you should have a beautiful, fragrant, glistening, crispy yet moist leg of ham in front of you. Try and leave it sit for at least 10 minutes to rest. If you try to do this though, place a guard, as the smell has been known to drive people to do desperate things. When you're ready to serve up, pick the most trustworthy people you know to help you pull all the cloves out and carve up (people who won't eat the ENTIRE ham whilst they are working!). ENJOY. This salad is a combination I have been mucking about with for years. I don't think there's a salad anywhere like it and I KNOW there's not a better salad match for a baked ham. The salad is deep, colourful, crunchy and clean. The dressing is rich, sweet, meaty and full of spice and not only does the dressing dress the salad to perfection, it makes a great accompaniment to the meat. Even though it's a bit of an epic to make, once made, the dressing keeps really well and it doesn't even need refrigeration if you bottle it hot. If it’s not fruity enough, you must have forgot to add the jam and prunes, because it’s ALWAYS fruity enough! The spices should be fine - their taste and aroma will emerge fully as the mixture cools and ages. Remove bones (if using), cinnamon stick and avoid serving up the cloves if you can (they will naturally sit on the bottom of the saucepan or serving bowl, so it’s not that hard to do). You can make this sauce up to 3 months ahead, bottle it up whilst its still hot into sterilised jars and keep it in the pantry. It is a terrific marinade for ribs and anything that would be good with a normal plum sauce will be double plus good with this. This salad starts with a base mix of equal quantities of mescalin or some other mixture of lettuce leaves (rocket, mazuma, enoki, nasturium - whatever you have to hand is great), mint and coriander. If anything, have more mint rather than less, as it is what really makes the salad. Wash dry and pick off the lettuce and herbs. Gently roast/toast some pecans. If you are roasting them in the oven, when they are done, push them to one side of your dish and add a line of sunflower seeds and a line of pepitas. Turn the oven off and let these smaller seeds and nuts dry out for 10 minutes or so. 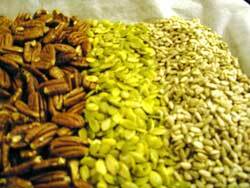 Similarly, if you are toasting your pecans in a pan on the stove, when they are done, push them to one side of the pan and put in a similar quantity of sunflower seeds and pepitas, turn the pan off and leave them all to dry out for 10 minutes together. 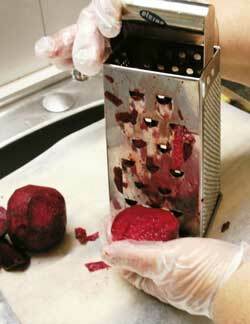 Peel and chunky-grate a fresh beetroot or two or three. 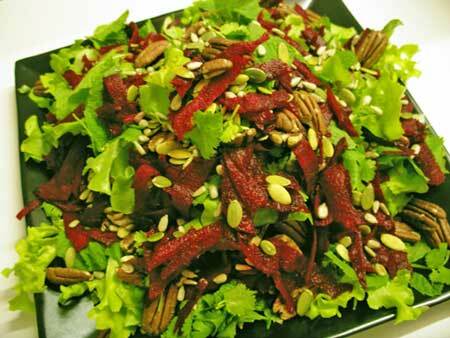 Scatter ½ your quantity of leaves and herbs evenly over a big, flat salad plate. Scatter ½ your beetroot over. Scatter ½ of each of the nuts and seeds over that. Come in a little from the edge (building some height to your salad) and repeat layers with 2/3 of the remaining ingredients. Come in a little more and pile the ingredients that are left up so the plate is this amazing heap of green and red and brown. Have dressing warmed through. 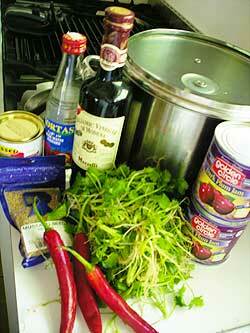 Place in a bowl beside salad with a large soup or serving spoon in it. 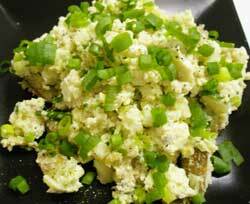 If I have a lot of old folk and/or really ‘square’ eaters, I will usually do an egg or potato or coleslaw-ey salad as well - something bland and reassuring. In fact, you can see in the pictures from yesterday that I also baked some potatoes for a warm potato salad while I did the ham. Depending on who’s coming (as above), if you want, you can roast some potatoes during the first hour that the ham is cooking, then cut them up, leave them to cool until the ham is nearly done and add shallots, mayo, salt and pepper and maybe some boiled eggs (as we did yesterday) for Pete’s favourite thing: Warm Tatty Salad or, you can also roast some potatoes in the second hour the ham is cooking and serve them in their jackets with a bowl of sour cream and shallots. 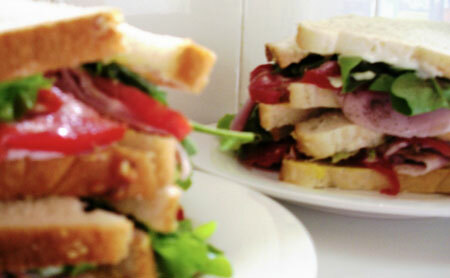 If there’s going to be a lot of kids and/or beefy men about, I’ll also shred lettuce and slice tomatoes and have mustard and buns - then those who want it can make themselves a beautiful sandwich (or two!). I know I’ve written PAGES about this meal, but this is NOT a reflection of its difficulty. This is really easy-peasy stuff and so much of it can be done ahead. You can make both the dressing and marinade days before and on the day, the lettuce and herbs and beetroot can all be prepped and washed and in the fridge and the nuts and seeds can be toasted well in advance. 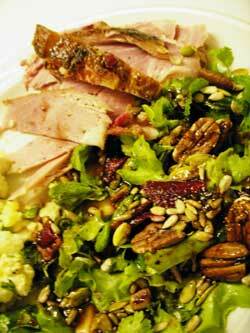 The ham itself is FOOL PROOF and all you have to do at the last minute is warm the dressing and assemble the salad. If there's a lot of detail here, it’s not because it’s hard, but because I think this is a great meal and I really feel confident and comfortable every time I present it and I really want you to feel that too! Which Tools Do I Need?